To quickly set the colors for all the general settings you can choose from one of our pre-made color schemes. After selecting a color scheme, you can still adjust individual color settings to your liking. The colors are very customizeable. Here’s a walkthrough of the settings and how they affect the display of the Draw Attention image. 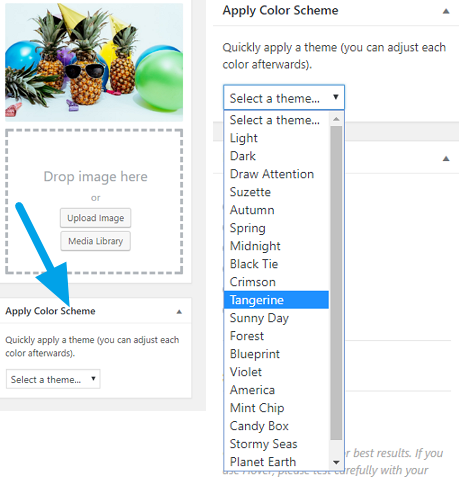 Optionally select one of our pre-made color schemes for your color settings. Depending on your theme, the layout you’ve selected, the size of your image, and the device the user is using to access your site, your image might not cover the entire image area. This setting allows you to select the background color that should display behind your image. You can match this to your theme’s background, to the image, or select a different color entirely. Set the color for the title that appears in the more info area. The font size and font family for the title is inherited from your theme for maximum compatibility. Set the color for the text that appears in the more info area. The font size and font family for this text is inherited from your theme for maximum compatibility. Set the background color of the more info area. Now that you’ve got the general settings done, you can move along to the highlight styles.